When the pain of a traumatic situation follows you for years, it is possible that you are dealing with a trauma bond to time. This teaching gives tools to diagnose and heal it. This is a two CD set. This two CD album starts with an overview of the previous teachings on how to identify and release a curse on time. Then Arthur moved into new territory with the whole concept of events and issues that are “sticky.” In any given month, we are exposed to defiling and traumatic situations. Some attach to us and some do not. 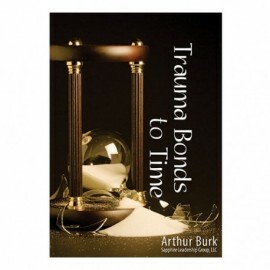 Arthur developed the theology for what makes a trauma “sticky” in the realm of time and then built out the diagnostic tools for determining whether a particular bundle of pain is likely a trauma bond to time or to something else. Then there was a live demonstration with someone from the audience Arthur had never met. It began with a description of the current pain, some diagnostic questions to take it back to the root, and then the personal ministry to release the bond. In between questions to the client, Arthur talked at length with the audience to explain the purpose behind the questions and the hidden meaning in what the client shared. This resource will enable you to go far with both identifying and cleansing trauma bonds to time. If you personally, or someone you are working with, has been through a significant amount of personal ministry for a known trauma, but are still not free, it is worth your time to explore this tool. This album was released in 2011. I first listened through "Trauma Bonds to Time" near the end of 2017. The idea of a trauma bond to a particular period of time fascinated me and made sense. This was another tool for inner healing and cleansing, and something I could do. Beginning on January 1 of 2018, I followed Arthur's guidelines, systematically cleansing time, every day throughout the year. Sometime in the late summer, In a conversation with a friend, I recognized a pattern in my life that pointed to a potential trauma bond. For the previous five years, at least, something traumatic had happened every November, late in the month, that would negatively affect relationships, to the extent that it would take me well into the spring months to recover emotionally. At first, I was tempted to dread those months this past year. Remembering that I had been cleansing time all year, though, I decided to see what the Lord might do this time around. God Is so wonderfully faithful and kind! At first, I thought I might totally escape anything negative. Then, on November 29, I received an email that felt like a direct attack on my identity and sent me into an emotional tailspin. The next couple weeks were rough. Two close friends praying with me and giving me a new strategy for dealing with pain. Two more friends sharing another strategy that I started to implement several times a day. A Sunday sermon that reminded me of yet another strategy that the Lord had taught me 35 years before, but I'd forgotten. I started up again. All three of these involved ongoing interaction with Him. Over the next three weeks, we took back time. It wasn't an "easy fix", but I'm not into easy fixes, anyway. They don't tend to last. The month of December, 2018, unlike previous Decembers, became a time of joy. It had little to do with physical circumstances, but everything to do with relationship. The long-term results have included a deeper, more settled peace; increased security in my identity; greater confidence in interpersonal relationships; and delight in partnership with the King. The strategy of cleansing time, by itself, didn't accomplish all of the above. I do believe it made a significant difference, though. For at least five years in a row, something in late November would precipitate a highly painful period that would last well into the following spring. This time, after systematically cleansing each day throughout the year, I ended the year of 2018 with a deep-seated joy, along with new strategies for living, that have continued into and through those months that were previously most painful. I look forward to the coming year, and whatever the King has in store next! Are you being held back by an invisible hand? I know the feeling. And I hate it. Fighting an enemy you can't see but who has you pinned down is awful. You may wish to explore this problem. It might be your enemy.